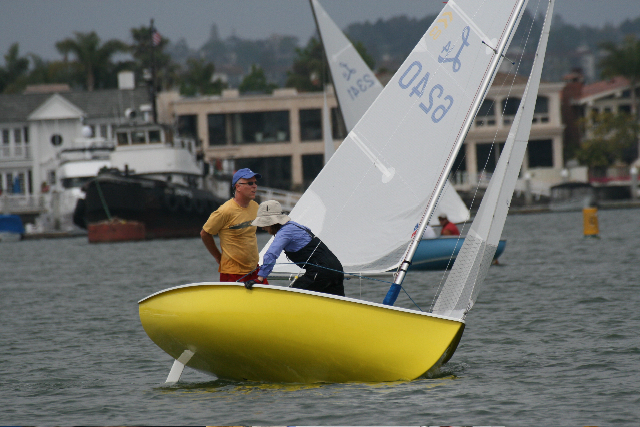 Hosted By Newport Harbor YC and W.D. Schock Corp.
Reports are coming in about the last day of racing being very trying. Apparently the winds switched from onshore to a Santa Ana off shore. During the switch, the winds dropped to zero and the race in progress was abandoned. Then the Santa Ana winds blasted the bay at 20+ miles per hour taking out several boats in the process as they worked their way from the race course back to the club. Len Bose capsized and perhaps he was the luck one as three others suffered bent (folded?) masts! All sailors reported to be in good condition after the wild ride. We'll keep you posted as more details come in. This year’s regatta had it all plus more than what was presented in the brochure. With overcast skies and winds out of the southwest and the promise of Santa Ana winds on Sunday, it was anyone’s guess on what the weather was going to do. I was greeted with the normal warm welcome from event chairs, Ann & Kurt Wiese. I then made the standard enquiry about the weather and Kurt response a smile and a “Uhhhhhh.” For those of you know Kurt he is not a person with a lack of words. I replied, “I have to assume that means who the heck knows what we will get this weekend?” “Exactly” Kurt replied. Day one started with an 8-9 knot breeze out of the south with a windward leeward twice around course. It has been brought to my attention that when the fleet races within the mooring fields by NHYC that protests seem to fly. This was exactly what happened to Ryan Davidson and I on the last run approaching the leeward mark in 2nd place with a very short beat to the finish. Although I am not sure if I had committed a foul, (not giving enough room to a weather boat at an obstruction) and being the start of a regatta, I decide to do my penalty turns. Afterwards a witness told us that we had given plenty of room. Although this did not make me feel any better, I did learn a lesson - when you are doing your circles, sail well out of the way because on my second circle I truly fouled Eric Heim. Fortunately Eric did not say anything. Speaking of Eric, he has sure taken his skill to the next level. Eric and crew, Aimee Graham threw out their first race 4th place finish then completed the event with 2, 1, 4, 1, 2. With shifty conditions and a number of light wind races, team Heim & Graham were off the starting line consistently in good shape and finding the first shift. 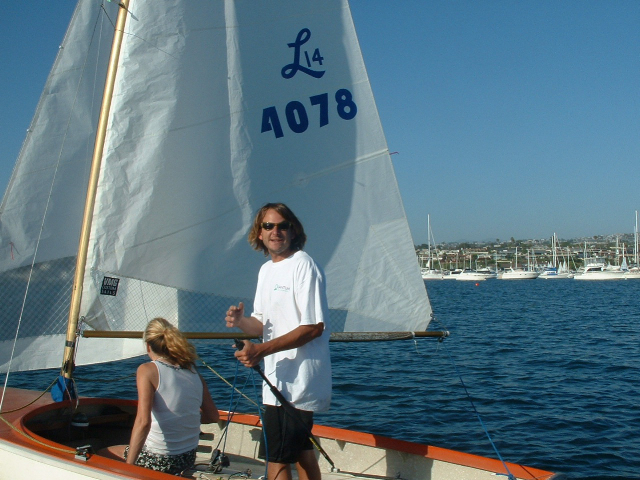 Then there was Team Little, consisting of Bob and his young children sailing at the top of the fleet. While rounding weather marks you could hear Bob say “Bobby PLEASE give me the pole back” and “keep your head down”. The best quotes of the regatta came from Saylor Little while fighting through no breeze on day one “Is this the doldrums?” How Team Little continues to stay at the top of the fleet in a VERY competitive class makes one smile in envy. Team Little also had the hindsight to return to the dock after race one on Sunday before all hell broke loose. What happens next was something that only occurs twice a decade - we won the next race! I need to be serious now – On Sunday the Santa Ana winds finally made it down onto the racecourse with a huge gust of breeze. This led a number of masts breaking and me capsizing. Two very important lessons need to be remembered. 1. Keep a bucket in your boat to bail with. 2. Chase boats must have the proper tools on board when all hell breaks lose. Don’t get me wrong - NHYC had the chase boats and I am very fortunate one was present at my capsizing. We must continue to remember the importance to the properly prepared chase boat. 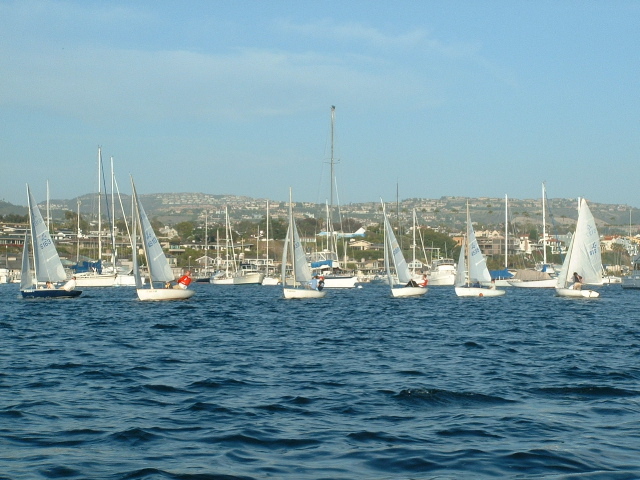 The “feel good” of the regatta were the actions of the class members helping one another during the number of puffs that rolled across the bay. Once we finally made it back to the dock, I had two people helping bail the boat. Other people were rolling my sails. As I stood on the dock wide eyed taking in all that just happened. The competitiveness was set aside and a true Corinthian sprit was felt throughout the fleet. This felt good and big thank you goes out to the whole class for stepping up to the task at hand.